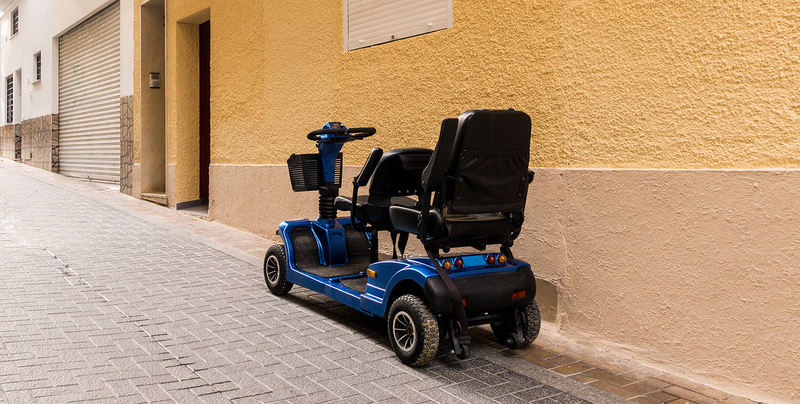 A mobility scooter can undoubtedly give a person with limited mobility independence; that could be a quick visit to the shop and back, or a long day out to the seaside with family and friends. As the technology on portable mobility scooters gets better, understandably the cost goes up. It’s a sad fact that mobility scooter theft is becoming more and more commonplace. Why are Mobility Scooters Stolen in the first place? Although, in most cases, these scooters are stolen to be sold, sometimes they are stolen by youngsters for a little joy ride and are found totally wrecked just a few miles away. If you’ve just purchased a mobility scooter or have had one for years, you can follow the steps below to prevent mobility scooter theft. For those who don’t know, most scooters have a freewheel setting. When this is on, the motor is unlocked, allowing it to be pushed along. There are many kinds of wheel clamps on the market which can be placed on the wheels to lock them. The great thing about these is that they prevent your mobility scooter from being freewheeled away. A wheel clamp is a strong, affordable solution (with prices ranging from between £10 - £20) especially if you leave your scooter unattended in busy places like high streets. Another option is a good quality bicycle or motorbike lock. These are both relatively inexpensive, can fit through the wheels and attach to a solid item such as a fence or lamp post. If you have a portable mobility scooter then, in most cases, you’ll be able to remove the battery and charge it in your own home. With a 6 – 8 mph you’ll either need an outside plug or a building with electricity. Whatever your type of scooter, it’s important to keep it away from prying eyes. A back garden shed, garage or conservatory is ideal to keep it out of harm's way but isn’t always feasible for everyone. So, if you have no choice but to leave it in a forecourt or porch, then make sure it’s locked and covered up to reduce the risk of theft. Although this doesn’t directly discourage theft, the National Mobility Register is an inexpensive way to improve the chances of being reunited with your scooter. The scheme was set up by the National Federation of Shopmobility and enables the police to return the scooter if found. It costs £12 a year to register your mobility product and can be done here. We would always recommend taking out insurance for your purchases, if only for peace of mind. Make sure the insurance policy covers Loss or damage of any sudden, unexpected and accidental cause, including fire, theft, storm and flood. Most insurance companies will have strict guidelines around “theft” so make sure you read the small print first. We recommend that you use Mark Bates Ltd who are experienced and trustworthy. If you follow some or all these top tips, we will hopefully be able to deter the theft of an item that you or your loved one rely on. As always, if you have any questions about the content in this article, don’t hesitate to contact one of our friendly team on 02392 255600 – we’d be more than happy to help.